Atlona has appointed audiovisual distribution firm EARPRO to represent its AV and control solutions across Spain and Portugal. Atlona's CEO Ilya Khayn and Panduit's vice president of enterprise business Tom Kelly shared their views on the recent deal. How many rooms am I managing? What technology is actually in there? Learn how technology managers are implementing solutions to gain insight into these questions. Atlona’s new CFO Ed Grabscheid talks strategic investments and growth. 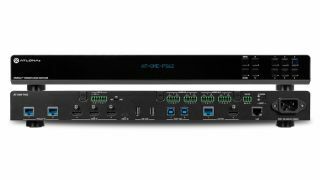 Atlona has added a new feature to its OmniStream AV-over-IP platform that enables distribution of 4K video with Dolby Vision dynamic HDR over standard gigabit Ethernet networks. Atlona’s native, software-level integration of the Zoom Rooms API aims to simplify and accelerate deployments from single meeting spaces to enterprise-wide collaborative environments.